Ever since I received a complimentary copy of this book from the author, I’ve had “Georgia on my mind.” Actually, I don’t recall much of the history of Georgia he relates, but the geography of the state haunts me. I can picture the original shape of the state, its various transformations, and its final shape. I can name the rivers that, along with the ocean, bound it along two thirds of its perimeter. I can account for the straight lines connecting the rivers. I can name the five states that border it. The history comes back too: the fact that there were five attempts to found the colony before the one that succeeded, the fact that the land of the colony west of the Mississippi was ceded by the mother country to France, the fact that the surveys of the northern boundary of Florida at one time or another added to and subtracted from the state, the fact that the survey of the northern boundary of the state is a total disaster, and finally the fact that the creation of Alabama and Mississippi reduced it to its present size and shape (map p. 95). Dr. Morton’s book is a gem. It is well researched, well organized and well written. The bibliography at the end of the book, which I doubt anyone will read, is more than 14-pages long. At the end of each chapter, important dates for the period covered in the chapter are listed. Each of the stages of the development of the colony or state is illustrated by a sketch outlining the area of the land in question. The statutory descriptions of the changing boundaries are quoted in full. The book is written in an easily readable style. It is succinct and coherent. Not bad for an amateur! By profession, Dr. Morton is a urological surgeon. But he is also a practicing attorney, a part-time county magistrate, a United States Coast Guard captain, a fly fisherman, etc., etc. History and geography are just “interests” of his. And this is his first book of this kind. The idea for the book came to him, he says, as he was crossing the St. Marys River on his way to Jacksonville, Florida. I can see him stop mid-bridge (maybe not! ), take out a map of Georgia, get out of the car, look back, and have the strange sensation that Georgia is floating in front of him. At the moment, it probably did not actually occur to him that its boundaries are physically and legally, let’s just say, fluid. But three years later, he could write that the de facto boundaries are, almost in their entirety, different from their more-than-200-year-old de jure description. 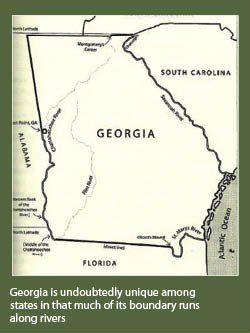 Georgia is undoubtedly unique among states in that much of its boundary runs along rivers. Its original charter granted the area between the Savannah and the Altamaha Rivers to their heads and from there along the Earth’s parallels to the South Sea. It lost all the land west of the Mississippi at the end of the French and Indian Wars. But then it gained the land ceded by Spain between its original southern border and the northern border of Florida. That border ran up the St. Marys River to its source, from there in a straight line to the confluence of the Flint and Chattahoochee Rivers, up the latter to the 31st parallel, and along it to the Mississippi River. The northerly boundary was eventually defined as the 35th parallel, extending westward from the Chattooga River. When this large territory was eventually chopped into three states, the western boundary of Georgia became the Chattahoochee River to a place called West Point, then went in a straight line through Nickajack (I’m not making up any of these names!) to a point on the 35th parallel thought to be at a bend in the Tennessee River. This description of Georgia’s boundaries is an oversimplification, but it should make obvious the role of rivers in defining them. The problem, of course, is that the boundary in or along a flowing body of water cannot be pinpointed to a hundredth-of-a-foot accuracy. The problem is exacerbated in the Savannah River by repeated dredging. Then too, segments of boundary lines have been submerged by dams built along several of the rivers. Add the fact that the straight lines have been erroneously located on the ground, and the state seems to be awash all around. It comes as no surprise that all of its boundaries have been contested in court. (The chapter on the boundary disputes takes up nearly a third of the book.) Only two corners of the state, the northeast and southeast, are fixed indisputably. Both were set by Andrew Ellicott in the early 1800s. Dr. Morton has tackled all these complexities with the eye of a doctor examining a patient who has been in a tussle but has suffered only nicks and bruises, or with the ear of an attorney hearing a complaint for the eighteenth time and having to tell the client that there is little legal recourse to bring the situation to an equitable conclusion. I do not want to end this review without pulling Dr. Morton’s beard a little. He engages in hyperbole when he says that, had the northerly line of Georgia been surveyed correctly, Chattanooga, Tennessee, would be Chattanooga, Georgia. Only a relatively small part of the city lies in the gap between the legal and the surveyed line of Georgia, and Tennessee would regret, but probably not much feel, its loss. Dr. Morton strikes me as the kind of man who has the generosity of spirit to take criticism in stride, being only too glad to have aroused interest in the boundaries of his home state. His temperament is much like that of Andrew Ellicott—his next subject of study.